We all have to start somewhere. 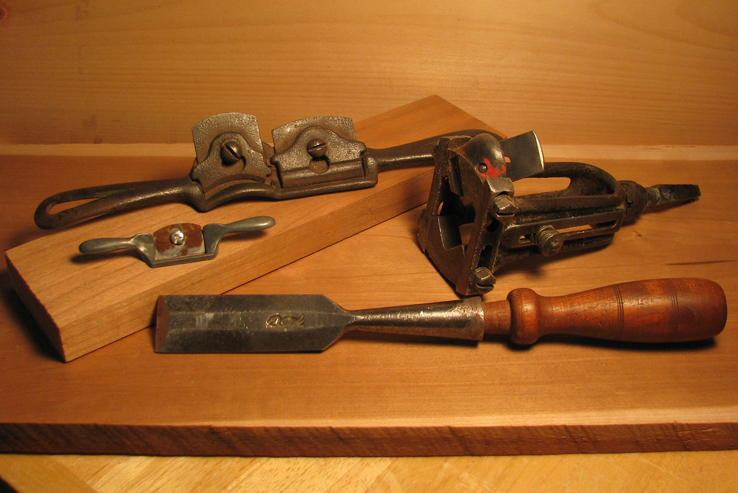 Nineteen years ago, and armed with less than a gram of woodworking knowledge, I would buy vintage tools that caught my eye at flea markets and auctions. I didn't know how to sharpen, much less use them. Looking back, sometimes I lucked out as a newbie and would score a nice socket chisel or adjustable tenon cutter. Other times, I'd end up with something that looks good in a photo on a blog, but are as useful as a laser light on a marking gauge. the garage would be a disaster. I also bought a LOT of lumber. Here in the middle of Pennsylvania, we're surrounded by farmland. And farmers always have stacks of lumber in their barns. 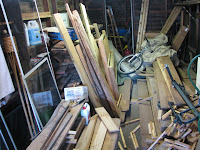 So, early on in my woodworking life, I attended many farm auctions. 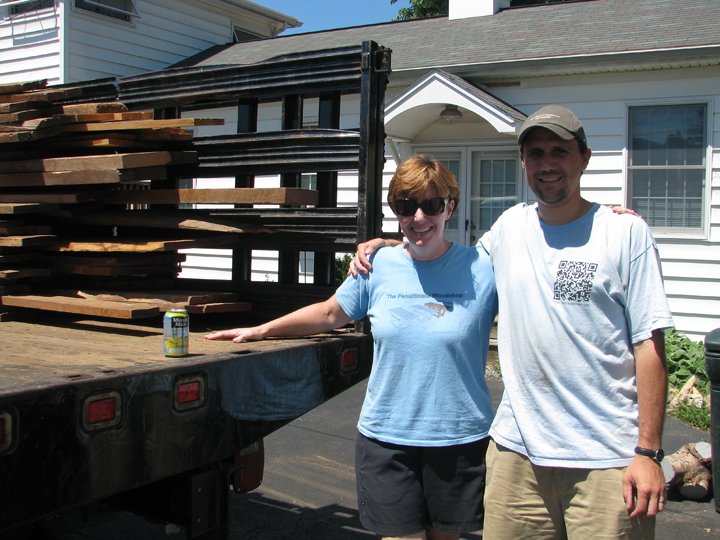 Rarely were other attendees interested in lumber; people were there to buy farm machinery. So, after awhile I wound up with so much wood we could no longer park our cars in the garage. 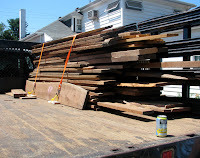 Back then, I'd buy whatever wood I could get that was cheap, not knowing if I'd like to work with walnut, maple, oak, cherry, poplar, beech, or apple (all the species in my stash). Dyami lifted five boards to my one. Nineteen years later, I know that I almost exclusively prefer cherry. Walnut's a distant second. Other than that, all the other species in my garage have sat for nearly two decades collecting dust and heaping mounds of mouse poop. I mentioned on twitter that I'd love to get rid of it and my friend, Dyami (The Penultimate Woodshop), came to the rescue. 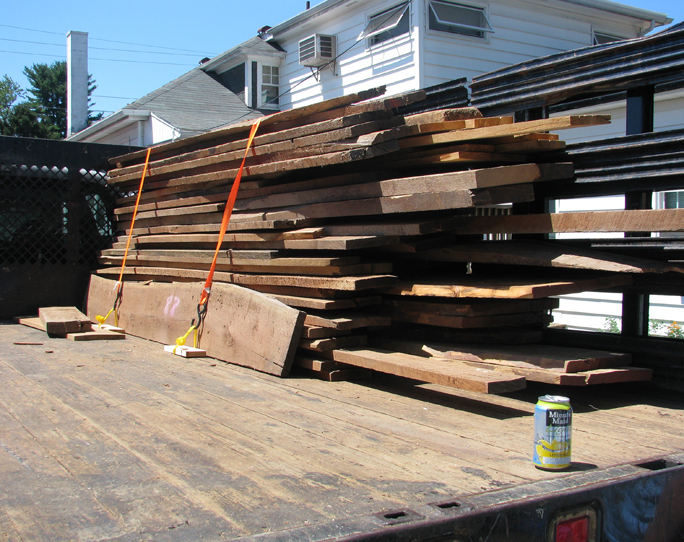 He drove down from Long Island with a flatbed truck and hauled a bunch of it away. My point is, there is no way to know as beginner woodworkers what types of projects and wood we'll be interested in years later. 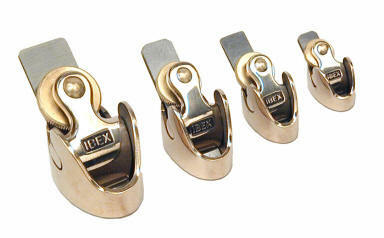 So, we're bound to buy things we'll never use (the unopened Leigh Dovetail jig box comes to mind). 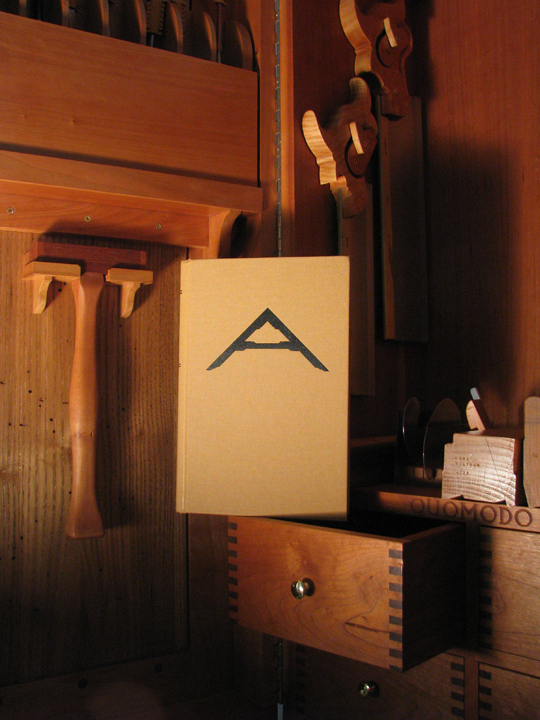 You could read every woodworking book on the market before you ever buy a tool or cut a board, but you still won't know your preferences until you start building. Chances are your tastes will change the more years you have under your belt. Since I've become more interested in working with hand tools, the dust on my router table and hollow chisel mortiser is as thick as a Dickens' novel. But, this is all part of the journey. They are not mistakes. Not only that, sometimes you get to make someone's day by giving them a bunch of boards that would otherwise have gone unused. And they can make your day by helping to clear out your garage. It's a win-win. Except for the mice. Who now need to find another place to call home. By the way, I'm not advocating setting up a complete workshop before you've even cut a board. Pick a few projects you like and get the tools you need to build them. There's a reason why I took so many classes with Ron Herman at last year's WIA Conference—he's a great teacher. 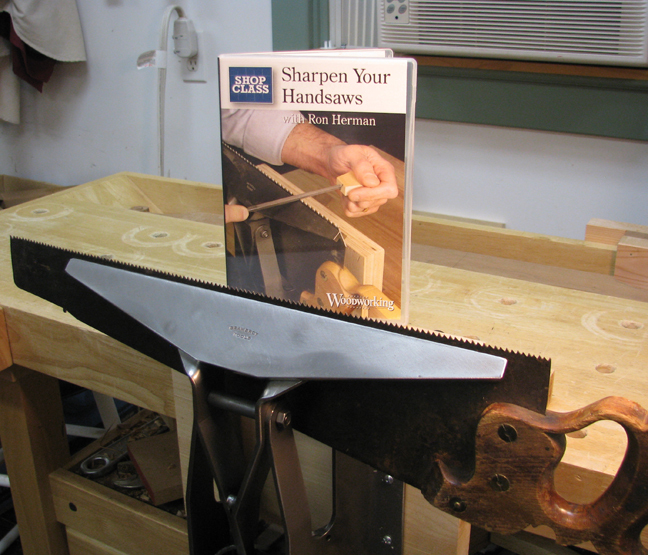 In his new video, Sharpen Your Handsaws With Ron Herman, he provides clear, concise instructions. After watching the video, you will know exactly how to sharpen handsaws—rip, crosscut, and miter. Also included with the video is a 14-page pdf file explaining saw terminology, sawtooth characteristics, how to use handsaws for ripping and crosscutting, file sizes, and saw till inventories for different types of trades (cabinetmaker, timber framer, etc.). Ron walks you through the sharpening process, starting with the basics—the parts of a saw and the few tools needed to sharpen them. 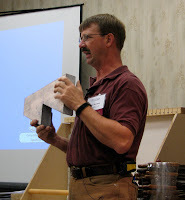 He tells you what to look for if you're shopping for a vintage vise and talks a little bit about vintage saws. From there, he works on a rip saw, then a crosscut saw, and briefly discusses miter saws. Saws are sharpened in this order: joint, shape, sharpen, test, adjust set. And when sharpening, you use your senses of touch, hearing, and sight. When you joint the teeth, pay attention to the sound. A consistent noise will tell you when you're finished. In great detail and with close-up camera shots, Ron shows how to sharpen saw teeth. Which are all apparently male. Little soldiers, in fact. 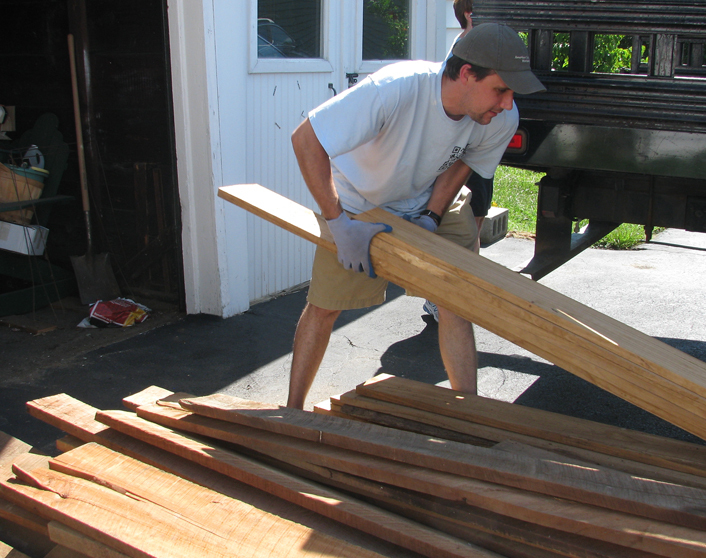 He explains rake and the degrees that works best with soft- and hardwoods. He talks about what to look for when sharpening, how to position your light source, and where to put pressure on the file to address trouble spots. Because he explains why problems occur, we become equipped with the ability to trouble shoot on our own. Is sawdust collecting on the teeth instead of in the gullet? Your saw is not sharp. And Ron explains why. He shows you how to position your body for maximum comfort and best results, and brings up safety issues on several occasions. He tests each saw after sharpening, eyes closed so he doesn't try to adjust the cut if the saw wants to wander, and shows how to remove and add set as necessary. He even intentionally messes up his careful sharpening by bending a half dozen teeth, testing the saw, and showing how to quickly correct it. Crosscut saws are a little trickier because of the fleam, but Ron makes it easy. In fact, all of it looks easy with patience and practice. You can see the introduction to his video at the bottom of this link. 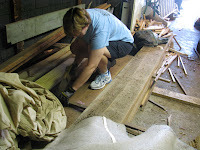 Geez, Kari, why go to the trouble of carving scrolls on the arms of your frame saw? It's just a utilitarian saw! 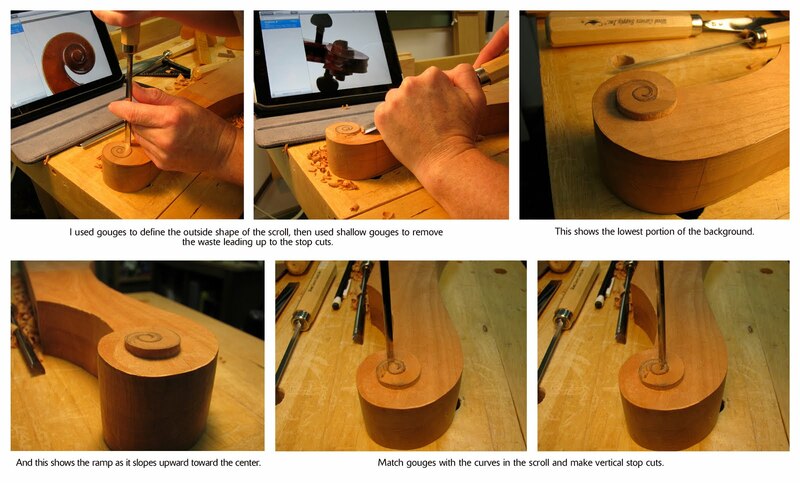 1) The Roubo illustration I'm using for reference shows scrolly arms and I think it looks cool. 2) I've always been fascinated with the volutes on violins and have wondered how they are made. 3) I like to carve. 4) I thought you'd find it interesting. 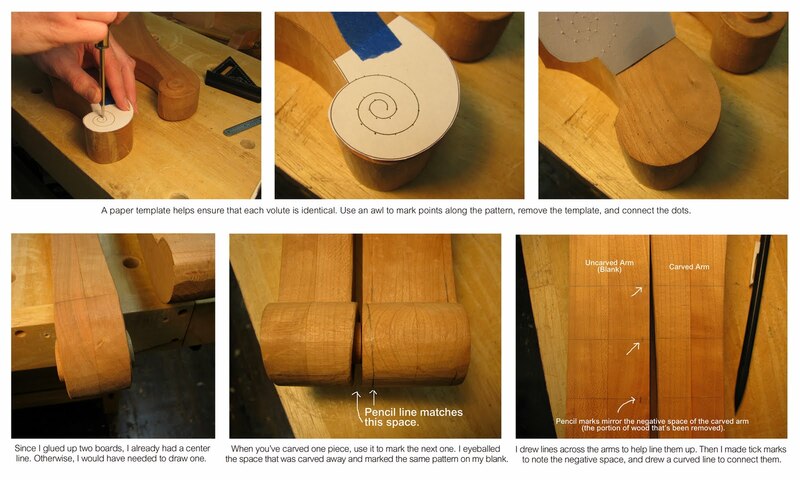 So, here is the method I came up with to carve these scroll shapes. First, I found some violin images to use for reference. The scrolls I'm making aren't as pronounced, but they do have a similar shape. It seems to me that carving them is akin to raising a panel: you have to lower the background in order for the volute to emerge from the wood. Next, I carved a slight downward curve toward the end of the arm and stopped at the point where the outside curve of the scroll starts. 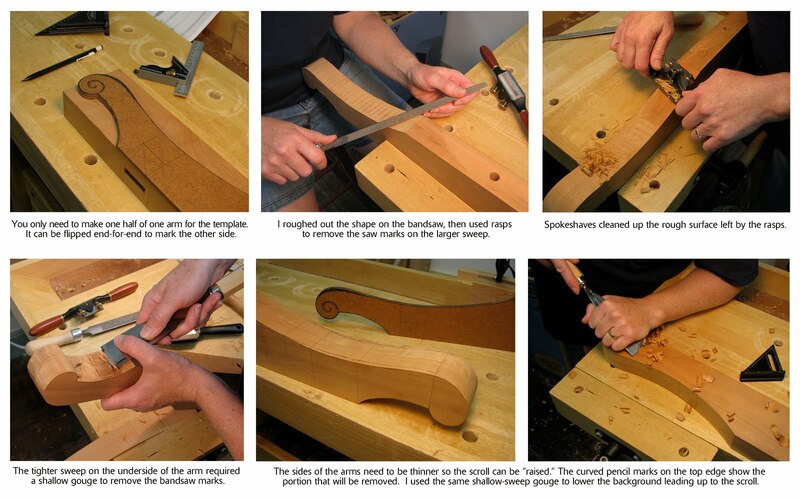 Then I defined the shape of the curves within the scroll by making vertical stop cuts with various-sweep gouges. 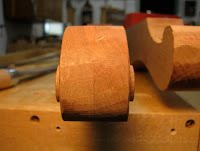 After that, I used gouges to cut toward the stop cuts. As I moved toward the center of the scroll, the cuts were more shallow which created a ramp that slopes upward toward the middle of the design. Once the basic ramp shape was established, I rounded over the sharp edges with chisels and gouges. 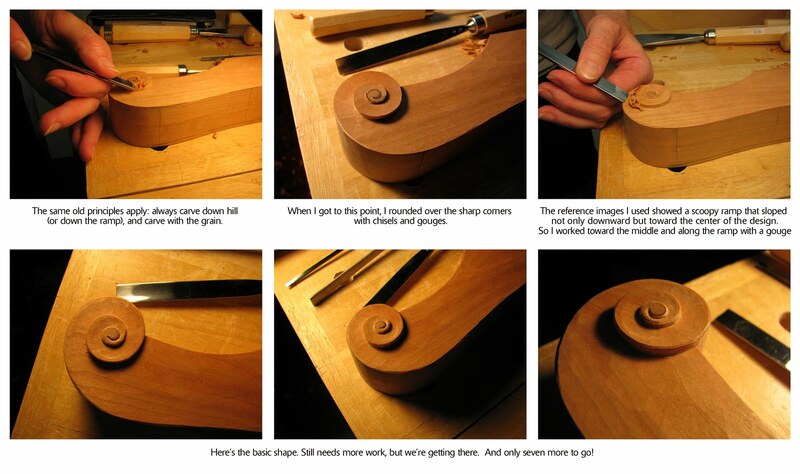 The violin images I used showed ramps that were both rising and scooped out from the outside edges toward center. If you're going to make a bunch of these, you might want to invest in some gouges that will scoop out this area in a couple passes. I don't have many gouges, so I used what I had. 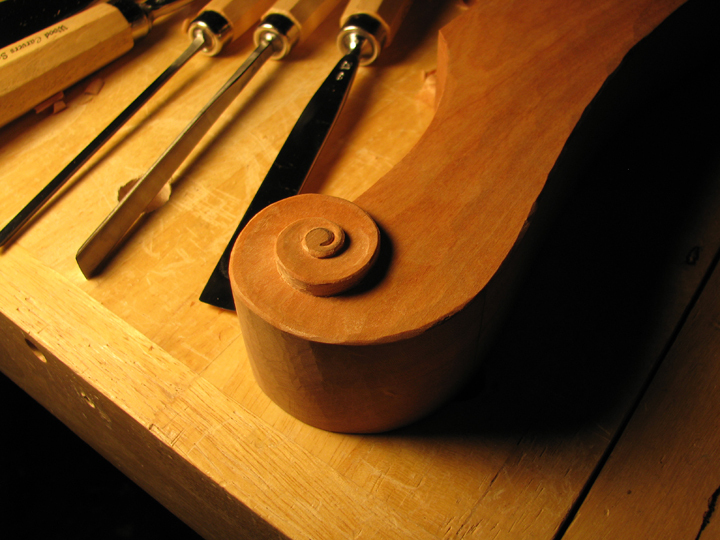 The height and scoopiness of the scrolls I'm making are much less elaborate and defined compared to violins' volutes. And they're way less smooth and refined. But, I'm leaving them the way they are. It is just a frame saw, after all.